Its impossible to explain this book without diving right in to Food52. Food52 came on my radar early. I have an email in my inbox from August 18, 2008, almost a month before the official launch. I guess that means I was a "beta" tester, and I've been a fin fan ever since. 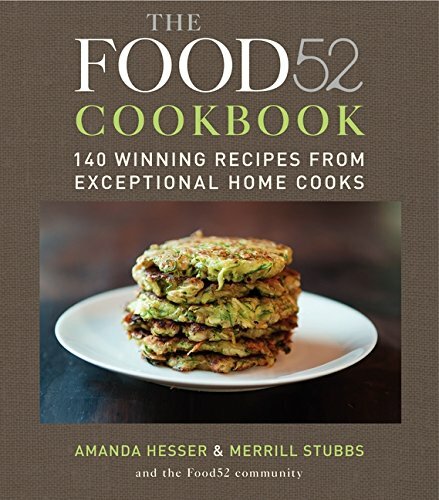 Food52 is the brainchild of Amanda Hesser, a former New York Times food columnist, and her gal pal Merrill Stubbs, who helped test and birth The Essential New York Times Cookbook, they started Food52 with the idea that home cooks had a wealth of creativity and practicality, and they should create a community to capture it. In the beginning Food52 was organized around weekly contests to find the "best" of each food type (think: best burgers, best asparagus, best movie snack, etc). The cookbook captures the initial 52 weeks of the community and the winning dishes from those early days. Today, the Food52 community is in the millions, the site is now a comprehensive cooking resource, a veritable food media powerhouse, and creator and host of the Piglet annual tournament of cookbooks, a college basketball-style bracket competition. The community competitions continue but more often you’ll find content on the site from expert freelancers covering a range of topics in their specialties (Italian food, Indian food, baking, you name it). Food52 has become one of my go-to online food resources alongside Serious Eats, and I have a hard time imagining a food life without it. Now back to the cookbook. . . Most of the community contributors are home cooks like me, and that doesn’t seem limit the range of creativity in the dishes. Inspiration for the recipes seems to be drawn from everywhere: family tradition, memorable restaurant meals, and adapted from favorite cookbooks. Each recipe is followed by a brief bio of the cook with tips or insights into the recipe. I often find myself with purchases from the farmer’s market but no clear idea what do with them. The Food52 Cookbook is one of the books I turn to. The book chronicles the competition over the course of a year and is naturally, organized by season. I can turn to the Spring section with asparagus in hand and find recipes for Preserved Lemon and Spring Vegetable Risotto with Grilled Pernod Shrimp (winner of the Risotto competition in week 40), or the Absurdly Addictive Asparagus (winner of the Asparagus competition in week 43). It’s not meant to be a comprehensive resource for seasonal produce, but it works for me most of the time. You really don’t need me to weigh in on the success of these recipes. They’ve already been tested by the community and became winning recipes. Each entry contains notes from the community, plus Amanda and Merrill comment on each one highlighting winning features of the dish. The recipes that I’ve made from here are all great, and based on the format of the competition I trust the ones I haven’t made are great too. That should make it an easy recommendation, but all the very same recipes exist on the Food52 site for free. I’m happy that I own the book, but if your shelves are already buckling from too much weight, head to Food52.com and cook from there. So many delicious flavors here: parmesan cheese, roasted cherry tomatoes, goat cheese, anchovy. It’s a delightful salad, although I'd skip the goat cheese spread on the plate, it gets lost and better to have it atop the salad. Put dabs of the cheese on top of the greens instead. I originally rated this a 5 even though there were a few misses on flavors, but I blame myself (using Honey Goat Cheese, and burning the Parmesan crisps). I'm downgrading to 4, but suspect on the second time around it could become a 5. I made this in cooking school, and the instructor warned to make double at home. Yup, this one is a winner. Full of a flavor, and best hot off the grill. Serve with an aioli or some kind of cooling sauce. I've also served these atop grits for a super quick meal. This was the first recipe I made from The Food52 Cookbook back in 2013, and I've been making it regularly ever since. The ingredients hit a few of my triggers: anchovies (yes! ), lemon (yes! ), garlic (yes! ), butter (yes! ), and the rest is all good too. You can swap out the broccoli with kale to equal effect, just reduce time in the oven to prevent overcooking the kale. And if you find yourself cooking for a crowd, learn from my mistakes and be a little sparing with the sauce, its better enjoyed on the lite side instead of the soggy. Best Thanksgiving leftover redo ever. One year we went a little crazy for Thanksgiving and hosted two Thanksgivings back to back. Our house was small and that seemed the solution to host both families. We smoked two birds! The downside: You'll be sick of thanksgiving food by day two. The upside: you'll end up with the carcass and can make delicious stock (x2).